That's it from the Siambr today. Senedd Live returns tomorrow morning when we'll be broadcasting the Equality, Local Government and Communities Committee. Members approve the Social Services and Well-being (Wales) Act 2014 (Consequential Amendments) Regulations 2017, which make consequential amendments to primary legislation that "do not impose or reduce costs for businesses, charities or voluntary bodies or the public sector". Members approve The Education Workforce Council (Accreditation of Initial Teacher Training) (Additional Functions) (Wales) (Amendment) Order 2017, which confers a further function on the Council to have regard to the Welsh Ministers’ forecast of demand for newly qualified teachers when exercising its accreditation function. Members approve the Unauthorised Deposit of Waste (Fixed Penalties) (Wales) Regulations 2017. These Regulations amend the Environmental Protection Act 1990 to insert a new section 33ZB. This enables Welsh waste collection authorities to issue a fixed penalty notice for small-scale fly-tipping offences. Such fixed penalty notices may be not less than £150 and not more than £400. If no amount is specified, the penalty will be £200. A discount may be applied for early payment. Fly-tipping is defined as "the illegal deposit of any waste on to land that does not have a licence to accept it", according to Keep Britain Tidy. The OED points to the term "on the fly" being used around 1851 to mean "on the move". Responding to a question from David Rees, the first minister says he would like more frequent meetings of the Joint Ministerial Committee (JMC) on Europe. The devolved administrations have threatened to withhold legislative consent for the EU Withdrawal Bill unless amendments are agreed to protect their powers through the process of Brexit. UKIP leader in Wales Neil Hamilton asks: "Who on earth goes into a negotiation saying 'no deal is unthinkable'?" He says the statement by the first minister is "a continuation of the Project Fear approach". Responding to the first minister's assertion that "at last there is some indication that the UK government realises it needs to work far more closely with the devolved administrations", Plaid Cymru leader Leanne Wood says the "risk of a power grab remains" in the bill to convert EU law into British law, questioning whether it will return powers from the EU to the devolved administration. The repeal bill - published as the European Union (Withdrawal) Bill - aims to ensure the rules currently set by European law still apply in the UK after Brexit, while giving the UK Parliament power to change them. Conservative Mark Isherwood calls on the first minister to be more "positive" about the opportunities of Brexit rather than "keep fighting the referendum". He says talk of reaching no deal with the European Union is a "negotiating strategy". First Minister Carwyn Jones sets out the potential repercussions of reaching no deal with the European Union, citing a series of "expert" organisations that have warned of the impact of no deal, including: the BMA, the British Airlines Pilots Association, British Retail Consortium, the Freight Transport Association and the Agriculture and Horticulture Development Board. He says “preventing this outcome, not preparing contingency plans, is what we must focus on. "To do otherwise would be like a passenger on the Titanic who, upon seeing an iceberg, chooses to find his lifejacket and pack his things, rather than rushing to the bridge and desperately attempting to alert the captain of the disaster ahead." The first minister is now providing an update on Brexit negotiations. 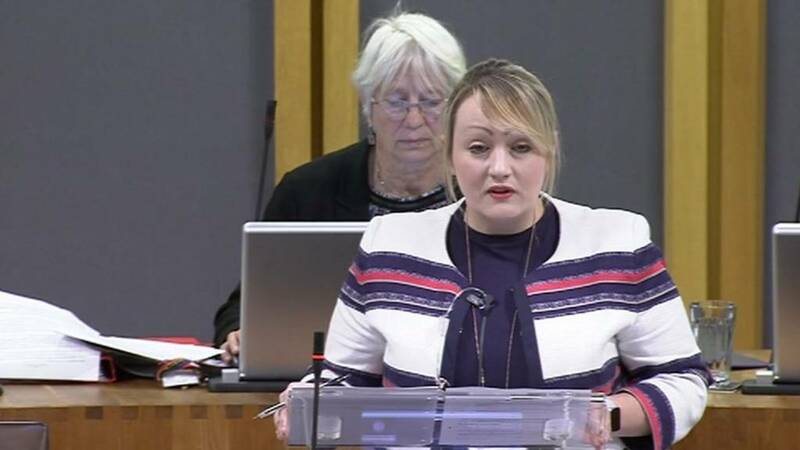 Plaid Cymru's Sian Gwenllian seeks information on what progress is being made in meeting the 20,000 affordable homes target the Welsh Government aims to provide over this term of government. She also seeks assurance that "recycled shipping containers" meet the needs of modern families. Mr Sargeant stresses the containers would only be used as short term living solutions for people in the most urgent housing need. Conservative David Melding finds "more than a hint of encouragement in this statement - and that's not always been the case on housing issues with the Welsh Government". Carl Sargeant announces 22 affordable housing projects to develop the "homes of the future" with the support of the Welsh Government’s Innovative Housing Programme. Initially funded by £10m per year over the next two years, the fund has been increased to nearly £19 million for this year because Mr Sargeant says he was "surprised and pleased" by the number and quality of schemes that have come forward. He adds this will not affect the amount of money available in later years. The next statement is by the Cabinet Secretary for Communities and Children Carl Sargeant, on the Innovative Housing Programme. Earlier this year Mr Sargeant announced a new programme to deliver "innovative models of housing to help increase the number of homes built" in Wales. The programme will contribute to the 20,000 affordable homes target the Welsh Government aims to provide over this term of government. UKIP's Michelle Brown questions whether the statement addresses the "fundamental problems and disincentives that have been identified with recruiting teachers into Wales". Clusters for supply teachers: why are so few schools involved? Plaid Cymru's Llyr Gruffydd seeks information about how the incentives for teachers compare with the rest of the UK, including incentives to attract teachers to rural areas. He also asks what the government is doing to secure more diversity within the teaching workforce in Wales. He welcomes the intention to set up clusters for supply teachers, but questions why so few schools are involved in the scheme. Conservative Darren Millar says teaching is a "rewarding, valued, high-status profession" which more people should be encouraged into. He expresses surprise that there was no mention of teachers' workloads in the statement. Education Secretary Kirsty Williams denies there is a "crisis" in teacher recruitment but acknowledges "challenges" in some areas and subjects in secondary schools. She says the highest level of financial incentive would be available for computer science teacher trainees in 2018-19 along with Physics, Chemistry, Maths and Welsh. She announces a £2.7m two year project which will see teachers working across groups of schools to cover teacher absence and to support wider school improvements. She says the new funding was about "being more flexible and innovative in our approach to covering teacher absence". The Welsh Government funding will support new supply arrangements for 15 councils and help 50 new teachers. We move on to a Statement by the Cabinet Secretary for Education Kirsty Williams on teacher recruitment.